Pirate Radio Address List "PIRATEN.WDB"
This is an information page about my pirate radio address list called PIRATEN.WDB. It's a list I edited in the years 1994-2006. So you can expect some experience with these matters from me. 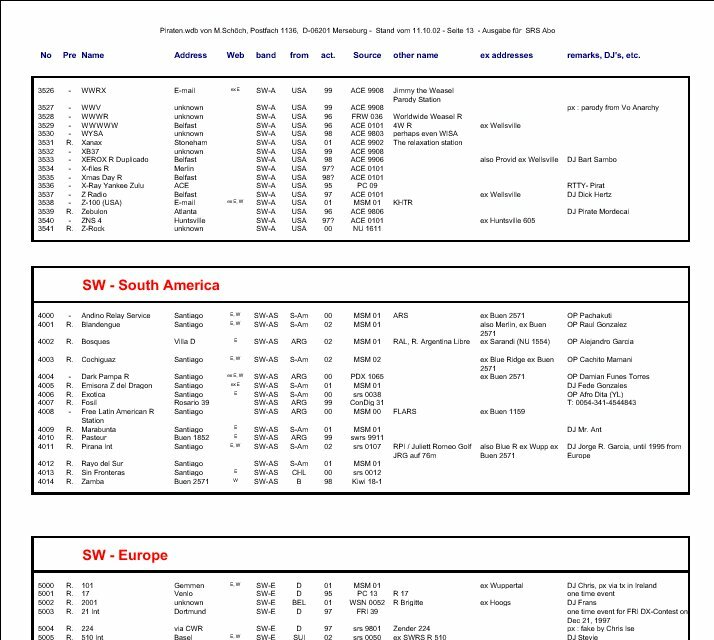 I took all available information about pirate radio FROM 1990 - 2007 and made one big list of it. The source of my information is always given in a special column. At the moment there are 3167 entries in the list. We are doing this to help other listeners to get more QSL's and even to help the pirates to get more letters, don't we ? This list contains certainly a lot of old and maybe outdated information ! Many information given are here are intended (and should be used) nowadays only as a reference ! I gave always the latest known information or address or a station. to someone who was last active many years ago ! 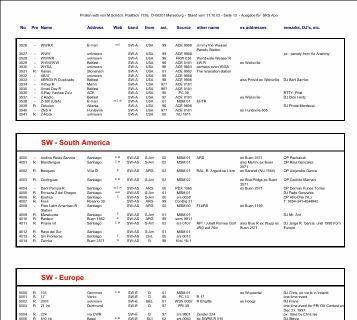 The Pirate Radio Address List 'Piraten.WdB' edited by Martin Schöch with more than 3167 pirates on SW and MW from around the world is now also available in an electronic version, as a pdf-file. The price is 3 USD for a one year subscription (6 USD/5 EUR for two years). Within this year you'll receive an updated list every month via E-mail. The pdf-files are ready for an easy print-out at home or you can look up the stations quite easy at your computer screen. The font size is small of course but the necessary program Adobe Acrobat Readers of course allows to magnify the page size on the screen. The electronic version will have the same content as the printed version, that means 50 A4-pages, a cover page and an explanation page and of course the index for all 508 different postboxes that appear in the list. The current list covers all pirates from 1990-2007. Martin Schöch, Postfach 10 11 45, 99801 Eisenach, Germany. Click on the pics in order to bigger versions ! Simply write to me, enclose the money in your letter (or use PayPal !) and you'll get access to an up-to-date address-list from me via E-mail/FTP. The stations are divided into regions and the order inside each region is alphabetically after station name. 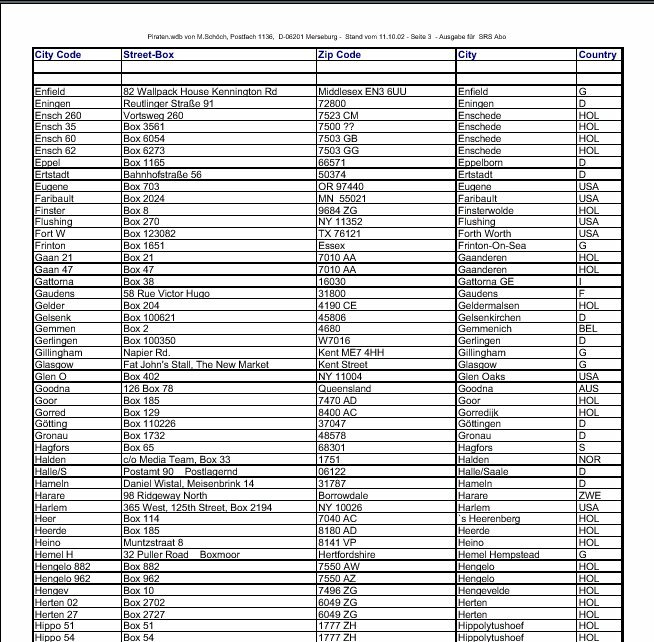 The list has 50 pages (normal A4). You can print it or use at your screen. to my QSL Information Pages QIP. You can get the 2 lists for the same price.. List (subscription 3 EUR / 3 USD per year) fill in your e-mail and also send me a short personal mail ! 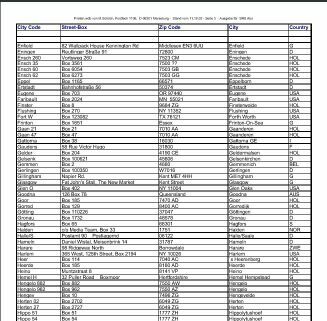 Other pirate radio address lists are/were available from Axel Röse, Neuss, Germany, Hans-Joachim Koch, ex Niddatal, Germany, Werner Schauermann, Niddatal, Germany, Wolfgang Erdmann, Hamburg, Germany and Klaas Vonk, Bergum, Netherlands. DUTCH MW PIRATES : The head of D.P.R.S., Derek Taylor has retired. But now his daughter Annette does the service. Address lists are not any longer available. If you want to contact a station that is (or was) connected with DPRS, simply send your 'rapports' with 2 US $ / IRC's to Preston ! The address is DPRS, 12 Dorman Road, Preston PR2 6AS in England. The Pirate-Service established by Patrick Willför (Langviksgatan 24 B 13, 65100 Vasa, Finnland) has closed down in 1998 (?) and will only re-open if DPRS closes down again. If you ever want to contact unknown GREEK MW PIRATES, please contact Z.Liangas, he may be able to help you ! Contact : 40 Ethaminis Str., 54621 Thessaloniki, Greece. For ITALIAN PIRATES - information also can be obtained via Play DX, Via Davanzati 8, 20158 Milano, Italy. Unfortunately also SRS Ytterby closed down in 2006, ex No 29 as well as later No. 49 are now closed. You might contact SRS Germany if you need a new driop box .. Thanks for cooperation and help to Jonny @ SRS and all the others !